OBJECTS & MATERIALS - ARTE AMAZONIA provides a global voice through art for the indigenous cultures of the Amazon. This collection is available for educational purposes. It reflect items from 20 different cultures including the Yanomami, Ye'kuana, De’áruwa, Hiwi, E’ñepa, Warao, Wakuenai, Bora, Shipibo, Tikuna, Yukuna, Kaiapo, Canela, Yawalapiti- Xingu and Kuikuro-Xingu. 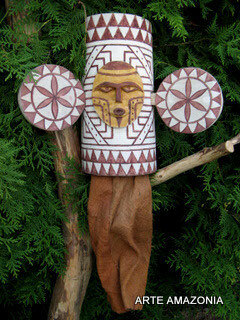 It includes bows and arrows, masks, baskets, pottery, calabash, moriche hammocks, maracas, seed jewellery, feather crowns, shaman tools, fire sticks, body stamps & more.